It’s also incredible that I manage to cook any proper meals at the moment, so when I do get a little window of time, it’s actually a real treat to make a proper recipe. Which is how this tart came about – we were having friends over for lunch on Sunday and the main course of coq au vin needed a nice French pud to round it off. 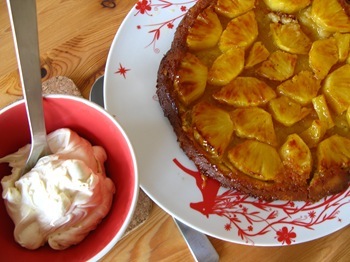 Tarte Tatin is such a classic, but instead of sticking to the traditional filling of apples, I played around a bit with a mixture of recipes (Roux Brothers for technique, Thomasina Miers for the pastry) and used pineapple instead, as I was feeling a bit festive. It tasted pretty damned good, even if I do say so myself. I ate three slices that day. Enjoy. To make the make the pastry, whiz the butter, sugar and flour in a food processor and then add the egg yolks, using the pulse button intermittently until you have a mixture that is almost coming together, like big breadcrumbs. Add a tiny bit of water bit by bit until the mixture comes together into a ball. Turn out onto some clingfilm, press into a flattish disk, wrap it up in the clingfilm then chill in the fridge for 30 minutes. Preheat your oven to 220C. 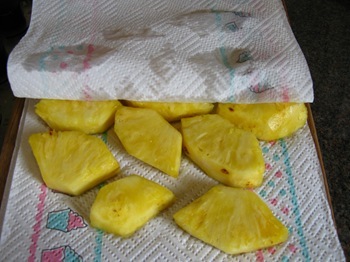 Cut up your pineapple, then blot on kitchen paper to absorb excess juice. Grease a non-stick ovenproof frying pan (make sure the handle won’t melt!) 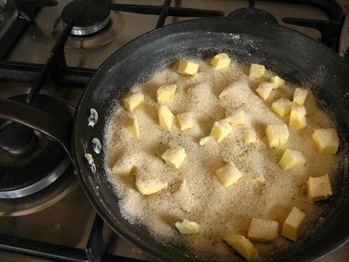 that is about 20cm in diameter, then cut the rest of the butter up into cubes and dot on the frying pan bottom. 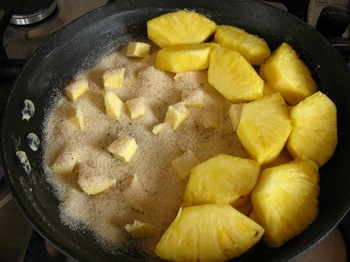 Cover with the sugar, then add the pineapple chunks making sure you don’t leave any large gaps. Roll out the pastry until it’s wide enough to cover the diameter of your frying pan, then cover the fruit, allowing for a 2cm overlap all round. Tuck the pastry in around the edges, then trim the ragged edge with a knife to neaten. 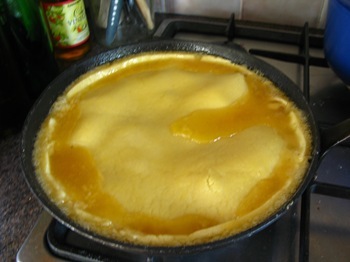 Chill the tart in the frying pan in the fridge for 20 minutes. Take the frying pan out of the fridge, then fry the tart on a fierce heat on the stove for about 10 – 15 minutes to allow the fruit to caramelise. Then bake in the oven for 10 – 15 minutes, keeping a close eye on the pastry to ensure that it doesn’t over-brown, as the oven will be very hot, and everyone’s oven is different! The tart is ready when the pastry is golden brown. 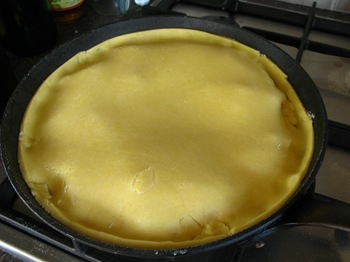 Allow the pan to cool down for a few minutes, but when it’s still warm, very carefully (using oven gloves and tea towels for protection against burning yourself) tip the frying pan and the tart upside down onto a serving plate. Voila – you will see your beautifully caramelised fruits on top of the pastry. 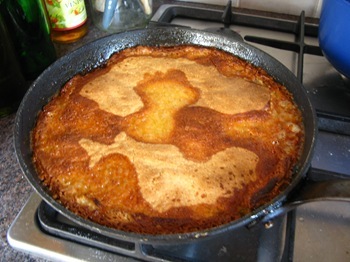 Some of the fruit will have come away, so reposition it on the pastry. Serve with whipped cream flavoured with vanilla extract and sweetened with a little icing sugar. Cut the tart with a very sharp knife, as the pastry is quite short and prone to breaking when you cut it. 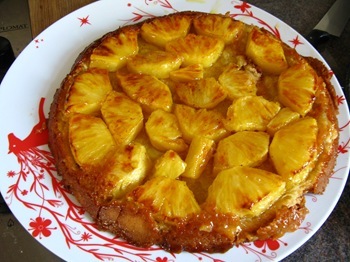 (I had tried sprinkling the fruit with cardamom powder and a little ground black pepper before covering it with the pastry lid, but I was too light-handed and you could barely taste it. Next time I’ll go at it with the big guns, ‘cause pineapple goes so well with spice). Wow, this upside-down-in-a-frying-pan-then-the-oven technique is new to me. Is this how all tarte tatins are made! ?I wonder if you could make cottage pie in the same manner? Put some potato in a frying pan, cover with mince, fry, bake, flip and voila!